Foliage of Alpinia malaccensis beneath a Caryota gigas (Giant Fishtail Palm). The very word is enough to get the pulse racing and the buttocks clenched. Oh dear. What have MAF and DOC done to this amazing family of plants! I must confess here my passion for gingers. They embody all the seductive qualities of the tropics with their lushly layered foliage, and exotic, perfumed flowers and I am indeed seduced. The ginger family is enormous. There are literally thousands of species of gingers around the world. Only two of them are weeds in this country. I'm interested in the rest. Being the sort of fellow who always wants what I can't have, I especially like the wonderful red ginger, Alpinia purpurata, from the islands that is used to make leis. It dies if the temperature goes below ten degrees. Damn it. But I grow it in the unheated tunnel house in the hope that one day it may flower. I'm certain by now that it requires a double-skinned plastic house that never dips below 10 degrees. Ever. 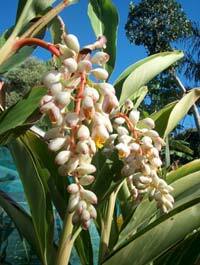 However, a rare and lovely ginger that thrives here is Alpinia malaccensis from Indonesia and Malaysia. 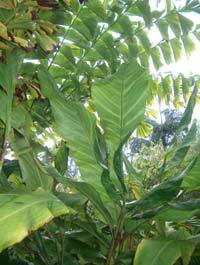 It grows to over 3m tall with big lush leaves subtly striped with lime green lines. In November and December the flowers emerge above the leaves enclosed in a conical sheath which splits to reveal a sumptuous cluster of fat pink and white buds. Arranged like a Christmas tree, the lowest ones open first to reveal a slightly sinister, yellow, mouth-like interior, vividly veined in bright red. One imagines pointy teeth could easily be hidden in there. This ginger looks its best grown in light shade with good shelter from the wind. Its slow to spread sideways and after five years growth, mine is still only a metre across, although its at least 4 metres tall and still getting taller. It has become a very beautiful, elegant plant that reminds me constantly of Bali. And how I'm not there. And it thankfully won't spread into the bush. 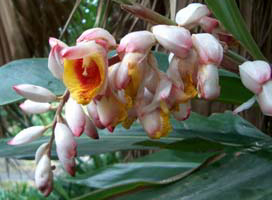 Equally lovely is the more well-known Shell Ginger from India, Alpinia zerumbet, whose flowers are similar to Alpinia malaccensis but they hang down like pink and white wisteria with vibrant yellow and red throats. The plant is not so tall, reaching about 2m usually. The stems tend to be more lax, leaning outwards from the centre. The leaves are a lustrous dark green in the wild form but spectacularly splashed with yellow in the variegated type which only grows to about 1.5m. But the leaves are a lively, year-round splash of colour. 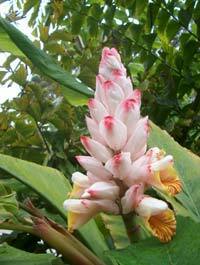 Unlike the other branches of the ginger family, Alpinia flowers aren't perfumed, or at best only faintly. But their glamorous foliage, slow sideways spread and long-lasting flowers make them better garden specimens than many of the more delicate or more aggressive gingers. Don't get me wrong about DOC's ginger publicity. The banned gingers are both Hedychium species and really are a devastating pest in our bush and very hard to kill. The problem is that their fleshy orange berries are eaten by birds who drop the seeds in the bush. Alpinias don't have edible berries and don't self-sow in this country, so they'll never be a weed here. If the neighbours get all breathless and excited because you've planted an Alpinia, just tell them to relax and get a life, and that a good clench now and then can be therapeutic, but too much of it'll give you cramp.